Hi Everyone! Finally, I can show my first project I designed for MayArts as one of their official May Arts DT Member. 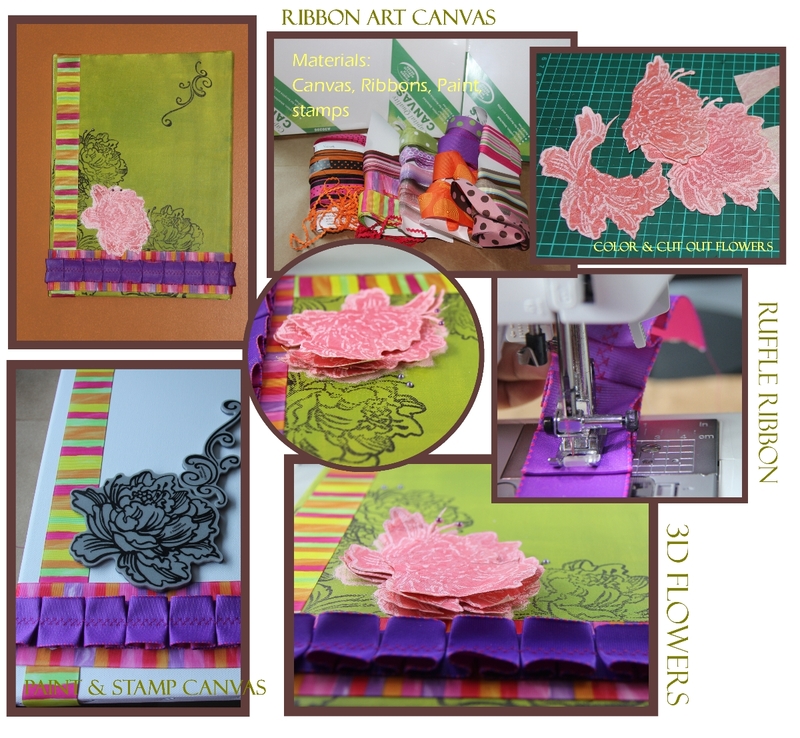 I am excited to share some Ribbon Art Canvases I created using MayArts Ribbons and the Stampendous Jumbo Peony Stamps. I was inspired with some Fabric Art Canvases I saw online so I decided to try it with ribbons. 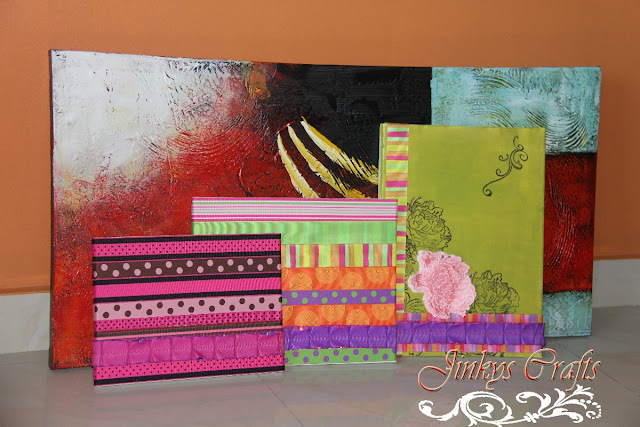 I love to incorporate 3D items that are functional in my projects, that's why I make sure that there are 3D objects on these Ribbon Art Canvases. I enjoyed working on this Art Canvas. The combination of MayArts Ribbons and Stampendous Stamps is perfect. Don't you just love my 3D Stamp Peony Flower? It looks so real, beautiful and Jumbo! I love it ! To get more realistic look, shape your flower cut-outs using a bone folder and use a 3-dimensional adhesive when you create your layers. 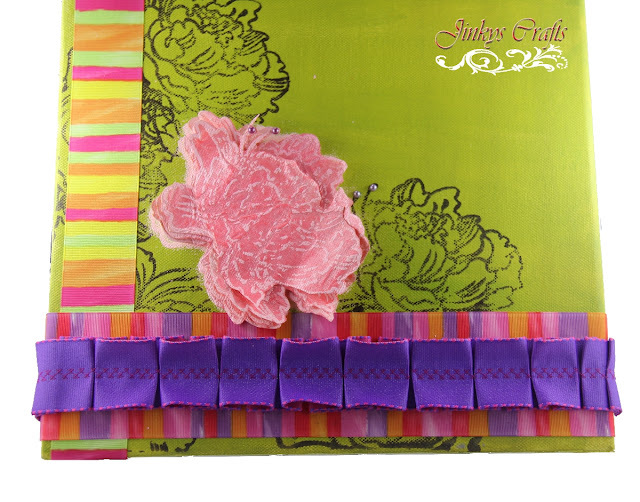 Paint up your canvas using a color that harmonizes with all of your ribbons. Cut enough ribbons depending on the design you want to achieve. Add enough length to each end to allow it to wrap around to the back of the canvas. Lay out the ribbons on the canvas to get an idea of the look you want to achieve. At this point, also decide on the placement of your stamp image if you are stamping your canvas. Stamp canvas, emboss and color depending on your liking. ( I did stamp my canvas using the Stampendous Cling Jumbo Peony Stamp Set+ Stampendous Jumbo Perfectly Clear Handle + Eggplant Purple ink pad . For the focal point, I used VersaMark Ink and heat emboss it. I then stamp more Peony image on a textured paper and color ed it with Cameo Rose using the sponge dauber. I cut-out the flowers image from the textured paper and created a 3D Peony Flower. Spray adhesive directly at the backside of the ribbon and attach it to the canvas. Note: if you are covering the whole canvas with ribbons, it is more easier to spray the canvas with adhesive and lay your ribbons on the canvas. Optional: If you want to create a Ruffle Pleated ribbon. 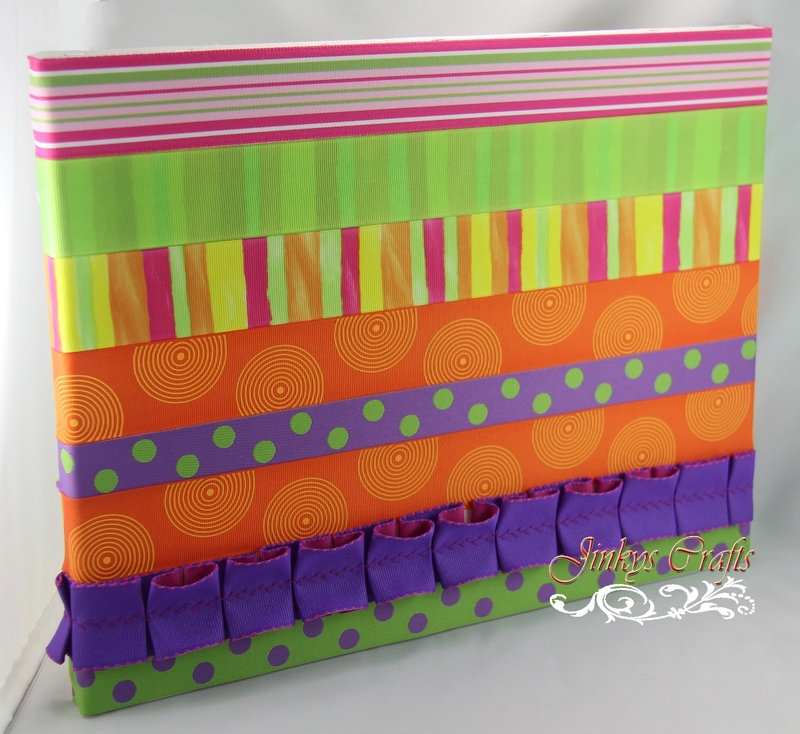 Just create pleates on the ribbon of your choice and sew a straight stitch. Attached the 3D Peony Cut-Outs right on top of your embossed flower. This is your focal image. Hang on your wall and admire! I enjoyed making these Ribbon Art Canvases. I made a couple more. I think they are beautiful. I will try to make more with some hardware embellishments attached to it. And when I'm all finished I will hang it on my home office wall. Give this awesome project a try . This is an inexpensive way to decorate a wall. You can even make a new look on every season or when you are tired of the design. Just remove the ribbons and re-use them on other projects and start over! These all turned out so awesome Jinky!! You are a creative genius! ha I think your dimensional flower is really gorgeous. And those ribbon canvas art pieces are so simple but so cool! Great job girl!